Bitcoin Scarf #WearableWednesday « Adafruit Industries – Makers, hackers, artists, designers and engineers! 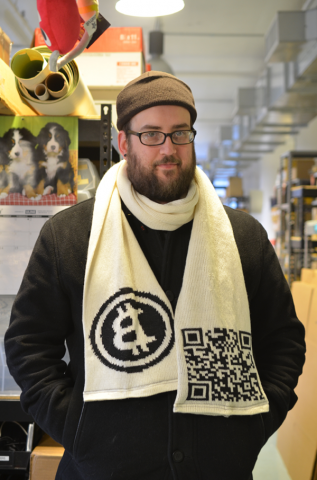 I had so much fun making the binary scarf on our electroknit machine at work that I had to come back and make a QR code scarf to go with it. I began with a QR code of my bitcoin address (as displayed in my wallet client, MultiBit), and a copy of the bitcoin logo off of Google Image Search that I made into a one bit bmp in Photoshop. I began by knitting the QR code right way up, followed by knitting roughly 5 feet of single-color scarf, and finally the upside down logo. Unfortunately, I flipped the logo in one dimension but not the other, leading to a backwards B. It still looks ok, and the scarf is incredibly warm! Just in time, too… yesterday morning NYC broke some records going back to 1896!